Three new PR♥ISM appear, who focus on supporting the Deck by adding more “return to the hand” effects. AUTO GB1: [Counter Blast 1] During your Battle Phase, when this card is returned to the hand from (RC), you can pay the cost. If you pay it, choose 1 of your “PR♥ISM” Rear-guards, return it to the hand. If you return it to the hand, draw 1 card. AUTO (RC) GB1: When this Unit boosts a Grade 3 or higher “PR♥ISM” units, choose 1 of your other “PR♥ISM” Rear-guards, you can return it to the hand. AUTO GB1: [Soul Blast 1] During your Battle Phase, when this Unit returns to the hand from (RC), you can pay the cost. If you can pay the cost, choose 1 of your “PR♥ISM” Rear-guards, during that turn, it gains “AUTO (RC): At the end of a battle in which this Unit Attacks or Boosts, you can return this card from your hand.”. For Today’s Card, from the Clan Booster “Prismatic Divas” (on sale July 7th, 2017), we’re introducing the following 3 cards, all members of 《Bermuda Triangle》’s newest “PR♥ISM” Team, one based around sweets, “Sweet PR♥ISM”! “Sweet-PR♥ISM, Lupina”, when returned to the hand from the Rear-guard during the Battle Phase, can activate her ability! By paying 1 Counter Blast, return 1 “PR♥ISM” Rear-guard, you can draw 1 card! Aim to combine its ability with the Grade 4 “PR♥ISM-Promise, Princess Labrador” and “Sweet-PR♥ISM, Titis” (who we’ll be introducing next). “Sweet-PR♥ISM, Titis” is a First Vanguard with a skill that you can use to return a Rear-guard to the hand. When it Boosts a Grade 3 or higher “PR♥ISM”, you can return a Rear-guard to the hand. You can activate its ability when it Boosts a Grade 4 as well, so if it’s in the middle back-row Rear-guard Circle, you can activate this ability even after you stride. Among “PR♥ISM”, there are many Units, such as “PR♥ISM-Promise, Princess Leyte” whose abilities activate when returned to the hand, making this a handy Skill! Finally, “Sweet-PR♥ISM, Nern” is a Draw Trigger with an ability. 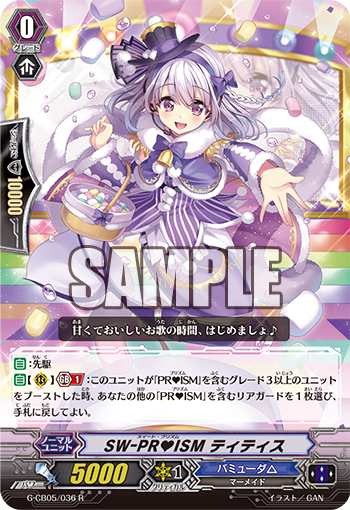 During your Battle Phase, when this card is returned to the hand from the Rear-guard Circle, a “PR♥ISM” Rear-guard gains “At the end of a battle in which this card Attacks or Boosts, it returns to the hand”! Return Rear-guards to the hand to aim for multiple atacks or just shore up next turn’s defenses. From here on out, we’re going to be introducing cards from “POrismatic Divas” in “Today’s Card”! Please enjoy!